Berat—A Charming Town in Albania. Last week I visited Berat for three nights. Berat is a World Heritage town and dates back to 314 BCE, and one of the most beautiful towns in Albania. Berat is a very comfortable charming town compared to the southern towns I visited. Arriving by bus after the long trip from Sardana, an older guy approached me and showed me a small booklet with a message of six different languages about his available rooms. For only 10 Euro and “breakfast” the place was great, and there was a place to hang my clothes to dry. The house was just behind the old mosque right in the prime spot of town. I also found a couple of good places to eat. 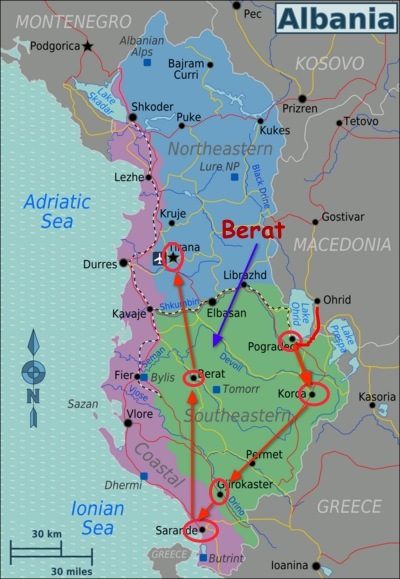 The mentality of Berat is considerably more mature that in the south, I asked many people what they thought of the south and they all agree with my perceptions, including people in Tirana. An interesting observation though is that Berat and many other towns in Albania is about 80% men, but most women stay home from the external observation. I found it interesting that some cafes were only older men, and other cafes were only younger men. The small town holds on to the old mentality of “reputation” and guarding (controlling) the daughter to avoid gossip and a bad family name. There lack a good view from a distance to get a camera shot of the castle. The steep long hill up to the castle will test the lethargic traveler, yet starting off in the morning after a raw food breakfast the cobble stone road up to the castle is viable. The Castle is an inhabitable that exists a small Christian town with over twenty churches. One person told me that the castle grounds is twenty hectors. There are people who walk up and down the hill everyday. 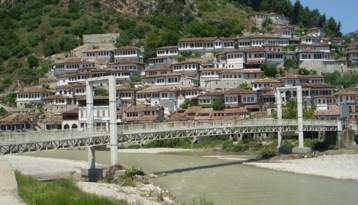 Berat lies on the right bank of the river Osum. The Osumi river has cut a 915-meter deep gorge through the limestone rock on the west side of the valley to form a steep natural fortress, around which the town was built on several river terraces. 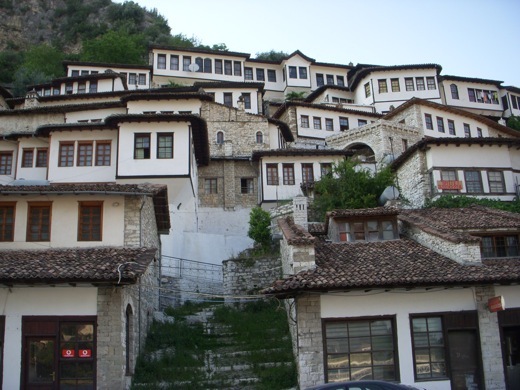 The town of Berat is renowned for its historic architecture and scenic beauty and is known as the “Town of a Thousand Windows”, due to the many large windows of the old decorated houses overlooking the town. According to an myth and legend of Albania, the Tomorr mountain was originally a giant, who fought with another giant, called Shpirag over a young woman. They killed each other and the girl drowned in her tears, which then became the Osum river. 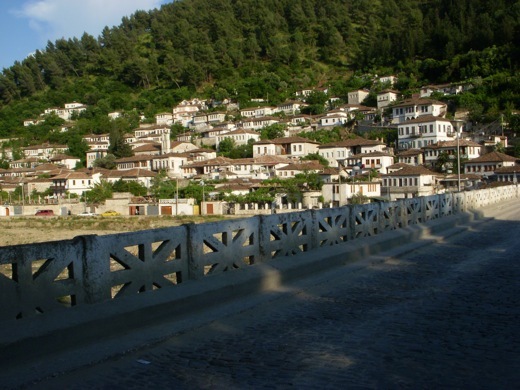 Berat was founded by Cassander as Antipatreia, who named it after his father Antipater at 314 BC. Dassaretae tribe existed in the area as the early as the 6th century BCE. It was captured by the Romans in the 2nd century BCE. The town became part of the unstable frontier of the Byzantine Empire following the fall of the Roman Empire and, along with much of the rest of the Balkan peninsula. 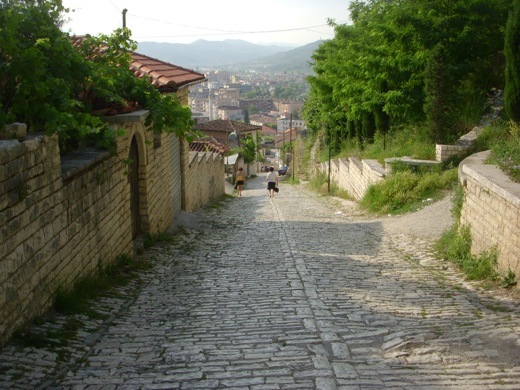 During the early period of Ottoman rule, Berat fell into severe decline. By the end of the 16th century it had only 710 houses. 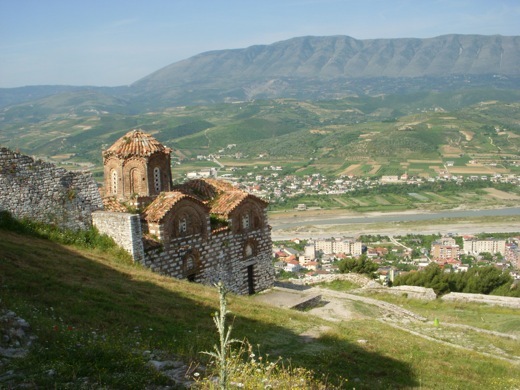 During the 19th century, Berat played an important part in the Albanian national revival. It became a major base of support for the League of Prizren, the late 19th century Albanian nationalist alliance. In November 1944, the communist-controlled Anti-Fascist National Liberation Council of Albania declared in Berat that it was the provisional government of the country, signaling the beginning of the long dictatorship of Enver Hoxha. Today I am in Durras, I stayed in Tirana for three nights. Next post: Slightly Inside the Beaches in Durres—Albania. Previous post: Hello WordPress.org, Goodbye Blogger!